Jalandhar: Much awarded for his singing and acting, Bollywood star-actor Ayushmann Khurrana (of movie Vicky Donor fame) entertained LPU students during his visit to the campus today. Amid his scintillating performances, LPU students’ Music Album ‘Verto’ was launched by LPU Chancellor Mr Ashok Mittal. ‘Verto’ album contains lyrics, music & singing by LPU students which has mesmerizing tones of Sufism, Classical, Western, Fusion, Rock and allied melodious harmonies. On this eve Music Concert ‘Verto’ was also organized to introduce and felicitate ‘Verto’ star cast. Massive performances by students and Indian Idol fame Sheena Chawla enthralled all. 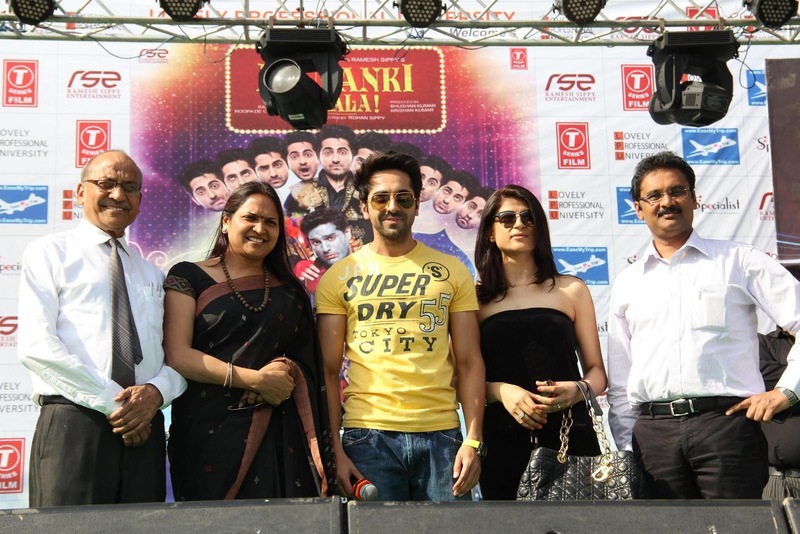 Accompanied by co-star Kunaal Roy Kapur, Khurrana was very delighted the way he wanted and enjoyed presence of thousands of LPU student-fans from all the Indian states and 30 countries. On the demand of students, Ayushmann sang two romantic and youthful songs of movie in his own voice and got connected well with the spell bound audience. One of the songs 'Sadi Gali Aaja' is Khurrana’s own creation and another 'Tu hi tu' is an innovation which took students into dream-world and left them happier and stress free than before. Being himself a great hard-worker, he advised the vibrant LPU youth to keep on efforts to let success come unto them all the way. He asked them to learn more and more to reach the heights. It is your most belligerent shining star in the field of music and dancing today. If you do not believe in me, then please have a look at Salvo Riggi's latest hit music album - Pain of Love. Great post. I also encourage you to explore this article. I was really inspired my many modern musicians and now I am writing music myself. I had to spend a lot of time searching for a good guitar on https://musiety.com/yamaha-cgs102a-review-half-size-full-value/ and it took a lot of effort to learn even some basics of playing but it definitely worth the effort. Ayushmann is an inspiration to many new comers like myself. I've always loved and appreciated his passion and love for music. His current musically videos are super awesome. I wish him all the very best. All other ringtones are carefully selected, suitable for your phone.